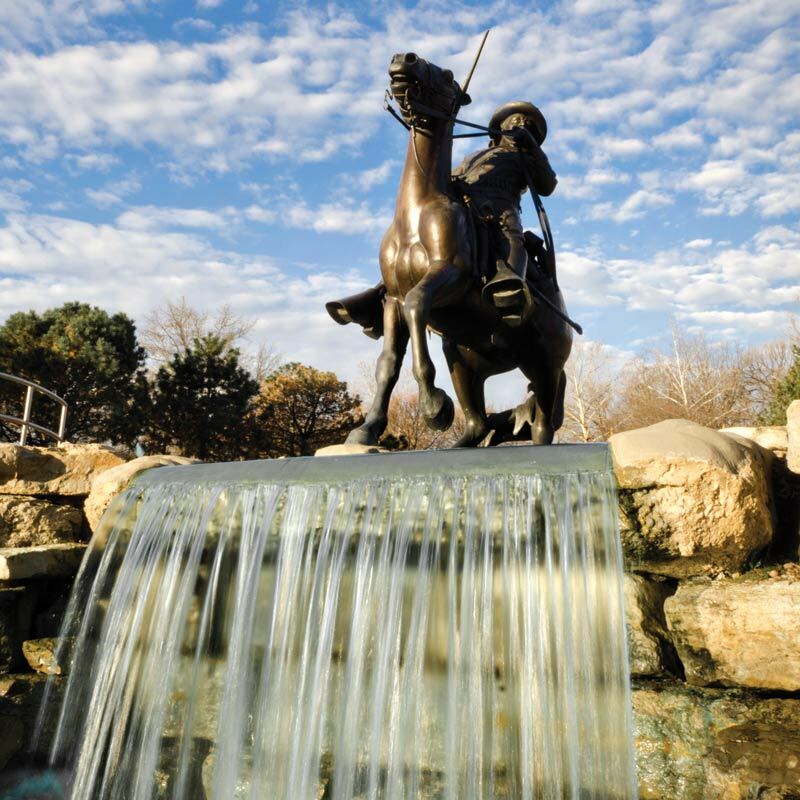 Explore the Lewis and Clark Trail region in Kansas and discovery fun cities, great attractions and friendly people! This is where the Corps rested and celebrated after completing the first difficult part of their journey up the Missouri River. Today you can see where history occurred, “shop till you drop,” and enjoy fun for the whole family. Lewis & Clark Park at Kaw Point, an inspiring historic site at the confluence of the Kansas and Missouri Rivers, is where Lewis & Clark and the Corps of Discovery camped and recovered after their exhausting journey against the rising currents and a strong headwind on June 26, 1804. 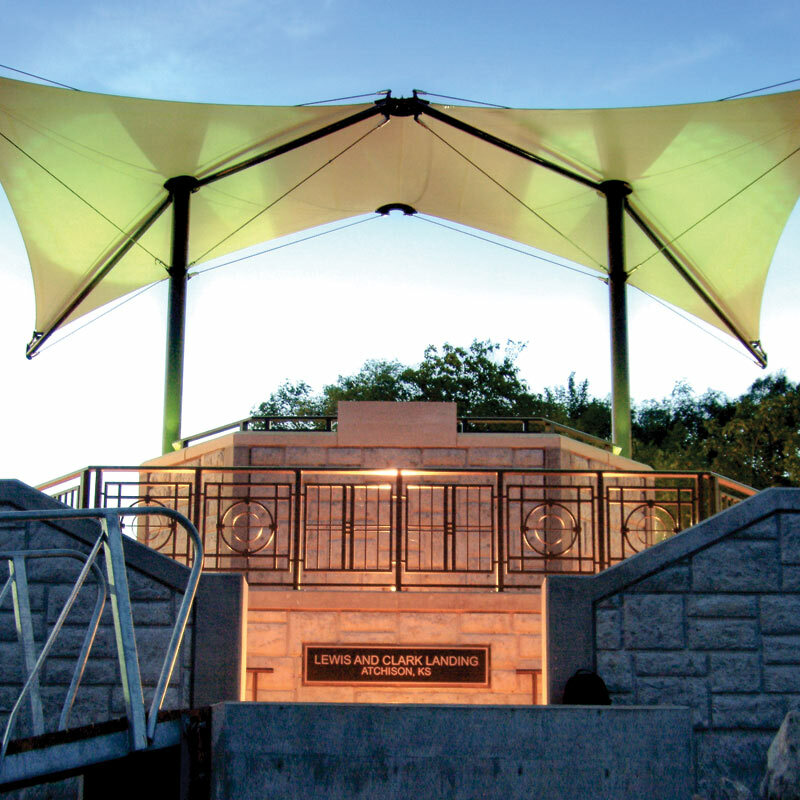 Today, the park offers walking and biking trails, an education pavilion, open-air encampment theater and outstanding views of downtown Kansas City. Murals and signage recognize the area’s history and Native American tribes. Kansas City, KS is home to Schlitterbahn Waterpark Kansas City, Kansas Speedway, Sporting KC and an array of exciting attractions, unique-themed restaurants and shopping experiences. The Village West area boasts 400 acres of shopping. Find big bargains at Legends Outlets Kansas City, Cabela’s and Nebraska Furniture Mart. History comes alive at the Quindaro Overlook, Old Quindaro Museum, John Brown Statue and the Underground Railroad Museum. All are part of the Freedom’s Frontier National Heritage Area in eastern Kansas. The city’s major attraction, historic Fort Leavenworth, is the oldest (1827) continually operating U.S. Army post west of the Mississippi. The Frontier Army Museum at Fort Leavenworth features a Lewis & Clark exhibit and houses one of the best collections of 19th century military weapons and equipment. The inspiring Buffalo Soldier Monument memorializes the African American officers and troops who helped bring peace to the frontier. The Fort’s cemetery is one of the first 14 national cemeteries established by President Abraham Lincoln. An audio driving tour leads visitors to 10 different historic sites in the area. 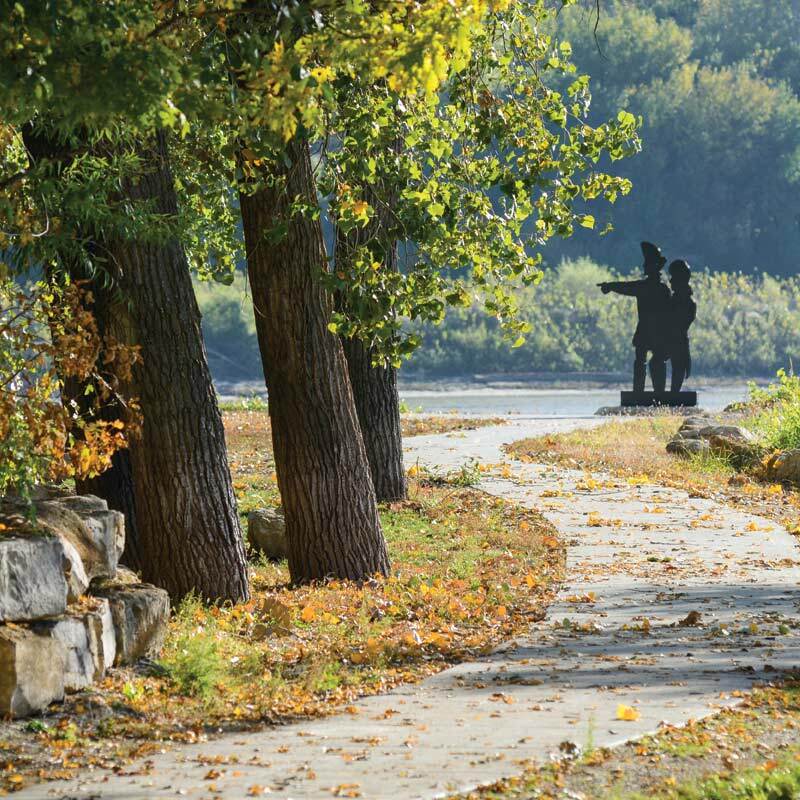 The Leavenworth Landing Park Walking Trail includes sculpture displays and wayside tour exhibits along the waterfront. on State Highway 7 and US 36 near the Lewis & Clark Trail along the Missouri River, includes Leavenworth, Atchison, Troy, Highland, and White Cloud linked together in a scenic area carved out by advancing and retreating glaciers in a long ago pre-history era. Lewis & Clark and members of the Corps celebrated the Fourth of July in 1804 near present day Atchison. They fired off the keelboat’s cannon and toasted the USA at their encampment on Independence Creek, accessible by car and from a 10-mile hike/bike trail from the Lewis & Clark Riverfront Pavilion. A Kanza Lodge which would have housed the Kanza Indian tribe sits near the encampment site. A keelboat replica play area, river overlook and boat ramps area are also located here. The Atchison County Historical Museum and Santa Fe Depot includes an outdoor collection of vintage railcars, plus a 1902 AT&SF Steam Locomotive in addition to miniature train rides for children. The Amelia Earhart Birthplace Museum and the one-acre perpetual plant portrait of the brave pilot who attempted to fly around the world will fascinate Trail Travelers. The Lewis & Clark Pavilion and Viewing Platform overlooking the Missouri River near the Iowa Indian Reservation provides an inspiring view of the Missouri. 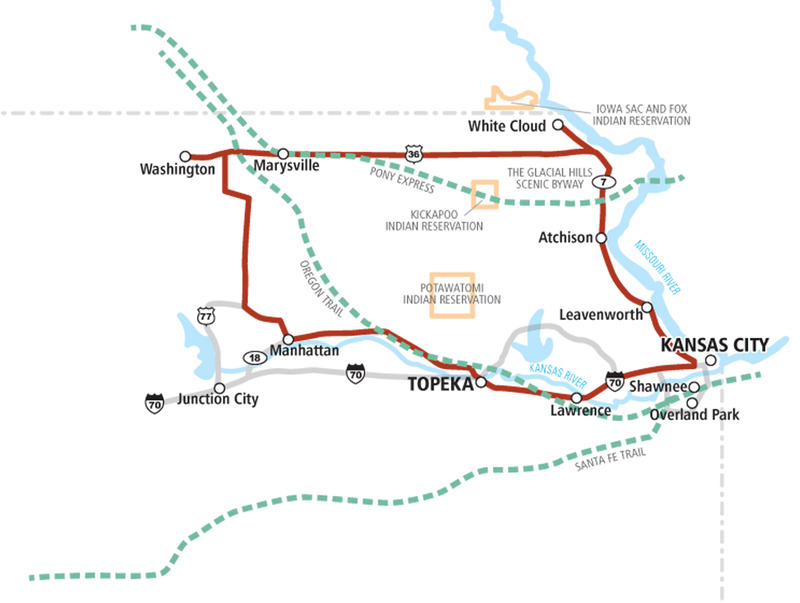 The Iowa, Sac, and Kickapoo Indian Reservations and the Iowa, Sac, and Fox Mission State Historical Site are included on the circle tour east of Hiawatha as it heads northwest on KS 136. The route parallels the Pony Express, Oregon and California National Historic Trails. Marysville shows off its heritage with a bronze statue of a hard-riding Pony Express rider plus lifestyle interactive murals and barn-quilt blocks depicting the Pony Express in the Marysville Park. The original Pony Express Station No. 1, Barn and Museum plus the Korster House Museum and the 11-mile Marshall County Connection are all popular visitor destinations as well as the Hollenberg Pony Express Station northwest of Marysville on the Little Blue River. Over 100 vintage cars, trucks, and tractors are on display at Herrs Memory Lane. Pony Express and Oregon Trail exhibit rooms are featured at the County Historical Museum. Manhattan is home to Kansas State University. Adjacent to the university you’ll find Aggieville, a 125-year old shopping district offering unique eateries, bars and restaurants. 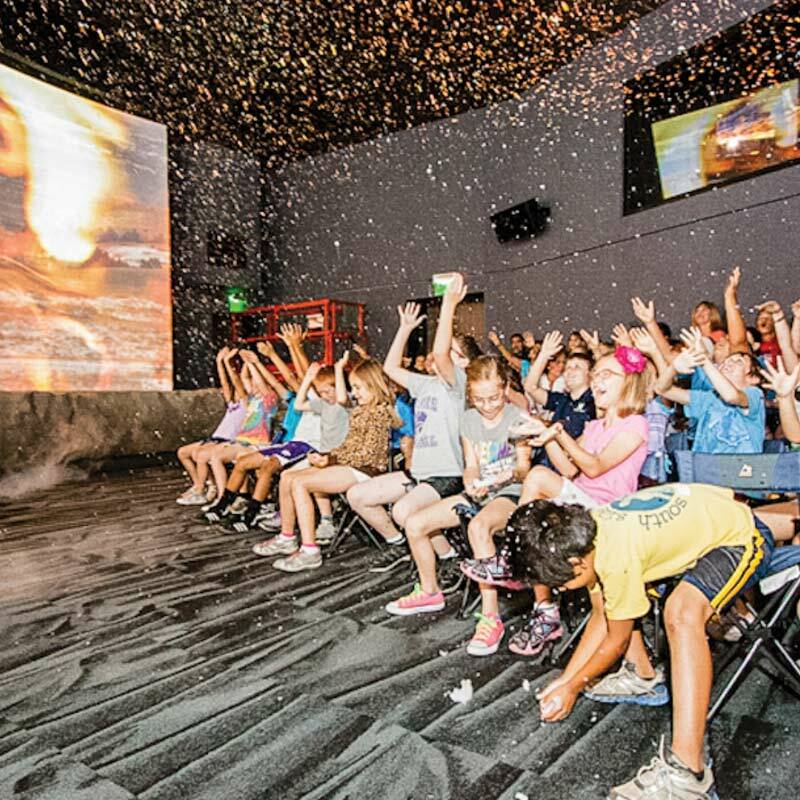 The Flint Hills Discovery Center in downtown Manhattan offers fascinating interactive exhibits for visitors of all ages. The Riley County Historical Museum showcases the area’s pioneer heritage. The Konza Prairie Biological Station features buffalo in their native prairieland. Walk on “the wild side” at the Sunset Zoo. The Wildwood Outdoor Adventure Park offers 7 thrilling zip-lines. Tuttle Creek Lake provides great outdoor adventures and is located 5 miles north of Manhattan on US Highway 24. Attractions include the Buffalo Soldiers Memorial Wall, the Civil War Memorial Arch, the Spring Valley School, the Wetzel Cabin Historic Site, the Geary County Historical Museum, plus Milford Lake, the fishing capital of Kansas. U.S. Army Fort Riley is nearby and features the Custer House, and U.S. Cavalry and 1st Infantry Division Museums. Visitors won’t want to miss the historic Kansas Capitol building. At the Kansas History Museum they can see a Cheyenne Tipi, a Wichita Grass Lodge, an 1880 Steam Locomotive, and exhibits and displays that bring Kansas’ extraordinary frontier heritage to life. Topeka also features the historic State Capitol building, Old Prairie Town, the Great Overland Stage Museum and the Combat Air Museum. The historic Ritchie House, the Topeka Zoological Park, the priceless Louis Comfort Tiffany stained glass windows at First Presbyterian Church and the Ted Ensley world-class gardens are popular destinations. The home of the University of Kansas and the Haskell Indian Nations University. The mounted remains of the cavalry horse Comanche, who was the lone survivor of the Battle of the Little Bighorn, is on display at the University of Kansas Natural History Museum. Lawrence invites visitors to stroll, dine and shop in its scenic downtown area. Attractions include the exhibits and documents at the Dole Institute of Politics, the Booth Family Hall of Athletics, the University of Kansas’ Natural History Museum, the Lawrence Art Center, and the Lied Performing Arts Center as well as the Watkins Community Museum of History. Shawnee Town helps visitors re-live life on the farm while the Wonderscope Children’s Museum opens young minds to the future. The Johnson County Museum’s re-created 1950’s all-electric home display adds still another dimension. Spark your child’s imagination at Deanna Rose Children’s Farmstead, where they can be hands-on with the best outdoor experiences! Take a stroll through the beautiful Museum at Prairiefire; the only location outside of New York to host American Museum of Natural History exhibitions. Get an adrenaline rush at iFly! Their 120 MPH wind tunnel allows to you experience free-fall conditions as you skydive indoors. Explore Overland Park Arboretum and Botanical Gardens or the Nerman Museum of Contemporary Art for a more cultural experience. Overland Park’s charming downtown is home to eclectic shops and local restaurants… all just 20 minutes from Kansas City, Missouri.